K1 Micro is specifically designed for use in bead filters, conventional pond filters and aquarium filters. K1 Micro has the same wheel shaped design as K1 Media, but it has an increased protected surface area of 950 m2 per m3. The wheel shaped structure of K1 Micro is designed specifically to create the most effective environment for the nitrification process to take place. As K1 Micro media matures, bacteria colonises in the “quiet areas” of each piece of media helping to improve nitrification / de-nitrification. This enables a well-balanced biological equilibrium to be sustained in your pond to keep fish healthy and the water crystal clear. K1 Micro retains the bio-film within its wheel shaped structure. A static bed of K1 Micro packs tightly together with areas for solid particles and fines to be captured, helping to reduce TDS levels. K1 Micro allows enough water to flow evenly through media rather than tracking around a “clump” of beads. This means that flow rates are improved when using “like for like” pumps. The improved flow also reduces the back pressure or resistance inflicted on the pump. In turn this improves the pumps’ efficiency and may even result in the need for a lower rated pump which will ultimately save you money! During a cleaning process, the bio-film remains protected within the K1 Micro. 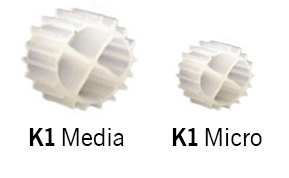 K1 Micro is a semi buoyant media which makes it ideal for a bead filter.